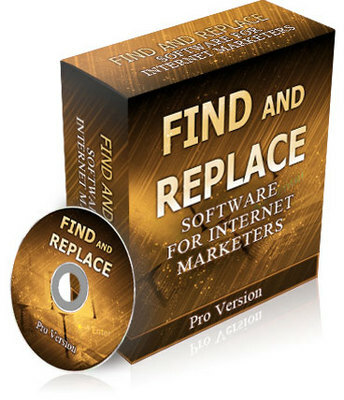 Find and Replace Pro - Instantly Modify Thousands of Web Pages or Text! Find and Replace Pro Includes Software User Guide With Easy Step-By-Step Instructions! When you've got hundreds or thousands of pages to manage, keeping them updated and relevant can be a challenge. Accidentally make a typo and you're forced to slave away trying to fix them. Let me introduce you to "Find and Replace." This tool is useful for batch replacing data in files to help you edit documents in a snap. 1. Enter the text you want to find. 2. Enter the replacement text. 3. Select the files you want text replaced in. 4. When you're ready, click "Replace." That's it! You save countless hours of time! Locates text or information anywhere on your computer or web server at lightning speed. Even if you have thousands of documents, you can sort through them fast to uncover what you're looking for! Ensures you don't lose any data while replacing text with optional backup feature. Relax as you change thousands of your web pages! Automatically takes out any blank spaces that can prevent CGI scripts from functioning. This ensures your editing is hassle-free! Edits any type of web document you want, including those in HTML, text, PHP, and ASP format! This is the ultimate time-saving tool for any webmaster. Saves countless hours normally spent manually editing and updating your files. Your sites are kept up-to-date and are reinvigorated with new life for more revenue! Select the files you want to edit with a few clicks of your mouse! You don't have to open and modify thousands of web page by hand!